I enjoy reading articles and tweets by technology fanboy Eric Topol, MD. He’s focused and intense. He’s always whipping out a smartphone-equipped EKG gadget on a plane or sticking a smartphone otoscope in Steven Colbert’s ear on TV. A lot of the tools he digs up seems to be of the “hammer looking for a nail” category and he’s created a nice gig for himself as a geeky critic of the medical establishment (even taking the AMA to task), but sometimes he comes up with ideas that might make a difference someday. Topol is an undisputed thought leader. I like what he has to say even if I’m often skeptical. 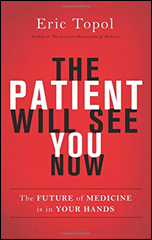 Topol’s new book, “The Patient Will See You Now,” is an impressive (some might say “undisciplined”) romp through the healthcare technology garden. However, it fails to live up to its title, which suggests that savvy, responsible patients armed with cool smartphone EKG devices and fitness trackers have quietly wrested control of healthcare from the government, corporations, and providers of “eminence-based medicine” that make up the plodding and oppressive medical establishment. It’s a cute and gimmicky title, but it contains more hype than the book can deliver. In fact, it sounds a lot like his earlier book (which I didn’t read) called “The Creative Destruction of Medicine: How the Digital Revolution Will Create Better Health Care.” That one is three years old, so maybe everything in it came true and he moved on. Technology is widely adopted. Patients know their own bodies better than anyone. Doctors are trained to feel superior and to control the flow of medical information. The smart phone is like the Gutenberg press in democratizing and disseminating knowledge. Angelina Jolie’s decision to undergo a double mastectomy because of genetic testing was earth-shattering, but the FDA tried to shut down 23andMe because that testing completely ignored FDA’s inquiries about its marketing and its offer to help the company comply with US laws. I glazed over on Chapter 5 because it was a complex and questionably relevant primer on how genes work and how they can be used to personalize medicine. The bottom line: we should be doing more genetic testing for research and individualizing treatments. Silicon Valley darling Theranos is revolutionizing lab testing. People have the right to see their own information. They should also be informed about the radiation dosage in diagnostic imaging. Patients should be able to see their medical records. OpenNotes and Blue Button give that capability, but only 36 percent of patients can access their records and EHRs are primitive. Prices for hospital services and drugs are irrational and vary widely, especially when comparing high US prices to those the rest of the world pays. We have a lot of waste and spend a lot on treating complications. Telemedicine is cost effective and convenient, but doctors resist new technology just as they did the stethoscope when it was invented. Hospital stays, which are expensive and error-prone, are declining as surgeries move to outpatient. Technology allows care and monitoring to be moved to the home. People are willing to share their medical data for research, which will allow collecting and collating information to discover new research and best practices. People are selling and stealing medical data. Sensors can predict and track medical conditions. Cheap smartphone-connected technology will democratize medicine to less-developed countries. People own their medical data. Big employers should be using it to squeeze big insurance companies, but none have actually done that. Consumers haven’t mobilized. CMS and other administrative waste takes a lot of resources out of the system. Other countries will do better because of our archaic payment and regulatory model. My frustration is that while the exhausting scattershot of technology nuggets is interesting (although hardly original since I’d heard of nearly all of them), it doesn’t prove the title’s hypothesis. It may well be that a few tech-savvy and demanding patients can convince their individual providers to let them get more involved in their care, but nothing suggests the presence of an unstoppable movement. In fact, while healthcare takes heat for being episode-based, a significant portion of consumers are even more episodic – they pay attention to their health mostly when something is bleeding, hurting, or swelling and then show up expecting a TV-like quick fix. The majority (especially the medically expensive ones) aren’t quantified-selfers or fully engaged participants. A lot of people have smartphones, health apps, and fitness trackers, but those gadgets haven’t proven to make them healthier. Capturing and tracking information is just a tiny and easy part, as evidenced by the significant penetration of bathroom scales in the homes of overweight people. Patients (or consumers or whatever you want to call the 100 percent of us who will seek medical care at one time or another) can make consumer-like demands on their doctors, hospitals, and insurance companies, but I’ve heard few examples of where that actually accomplished anything other than possibly getting themselves labeled as a troublemaker. People who receive medical services aren’t really pure consumers, so it’s not realistic to assume that the healthcare cheese can be massively moved by technology as happened in banking and entertainment. Patients don’t usually pay all their own bills. They go to whatever doctor and hospital the party that does pay (the insurance company) dictates, so threats to take their business elsewhere are usually hollow no matter how unpleasant or Luddite their doctors may be. Strap 10 smartphones with cool apps on your belt, pass out OpenNotes articles in the waiting room, and warn hospitals that they had better not make a medical mistake during your admission – your influence is still minimal despite being informed. Topol’s broad observations and complaints aren’t really actionable. Patients have little control over the items listed above. The book title suggests that patients are in charge, and yet it’s still insurance companies authorizing payments, doctors entering orders and performing procedures, and the much-maligned medical establishment standing between patients and their maker. The healthcare system (or more correctly, the healthcare industry) was built around everybody except the patient. That establishment isn’t just going to step aside because patients carry iPhones. Any plan that requires people to voluntarily stop doing what they’re well paid to do will fail. A few tech-powered concierge practices, retail clinics, and drug chains are threatening the status quo. They aren’t really scaring anyone. They may cherry pick a tiny bit of profitable business, but they aren’t much of a threat to health systems that keep buying up more providers and using their political influence as big employers to make sure they aren’t pushed away from the table. That’s the best hope for quick innovation that will reverberate through the hallowed walls, such as the real threat that Theranos will force high-margin hospital labs to either increase their efficiency or survive on a fraction of their current business. Healthcare is like your car (at least if your car was built in this century). Your car is loaded with sensors (some of which, like the speedometer, you may conveniently ignore) and requires a computer to analyze its internal computer data stream. You can’t diagnose and fix it yourself when the idiot light comes on. You can study up all you want, but your only real decisions involve (a) whether you want to get it fixed, and (b) who you choose to fix it given your available options. You sit impatiently until the mechanic hands over a grease-stained list of procedures he or she performed along with a bill (as in hospitals, the computer that creates the bill is the most powerful one). All of that technology and data didn’t benefit you very much – it just generated more business for the mechanic, allowed him or her to work more effectively, and maybe avoided even more expensive repairs down the line. That’s pretty cool, but it’s hardly a revolution in empowering car owners. That’s my takeaway from the book. Most of the technologies listed help doctors provide better care, assuming they are willing and able to use it. The role of their patients is, at best, to push for them to actually think about using genomics, following evidence-based medicine practices, reviewing their own outcomes information, and staying current on new medical developments. Patients, however, won’t usually voluntarily leave a doctor just because they don’t use an EMR or other gadgetry – that’s the art rather than the science of medicine – so it’s not really much of a threat. Consumer choice in healthcare involves choosing the “best” provider to interpret, order, and perform procedures (or at least the “best” one willing to see you that your insurance covers). A doctor might be willing in the seven minutes you’re allotted for a return visit to look at your fitness tracker information, sit beside you as you Google your condition, or describe their charges to the price list from the MinuteClinic down the street. Don’t count on it. You’re only as empowered as is convenient for them. Cardiologists make a great living and Eric Topol is no doubt excited to see his Scripps patients embracing technology and participating in their care, but it just doesn’t work that way for most doctor-patient encounters. People don’t get as broadly excited about health-related technologies as they might with social networking or music since the personal payoff is slower and less certain. Fitness trackers motivate and inform people who are already motivated and informed. Those aren’t the folks running up most of the country’s medical expenses. Topol’s confidence that abundant technology will upend the US health system in favor of patients seems wildly simplistic. We can all – as patients and industry insiders – make a long list of what’s wrong with healthcare. That doesn’t mean we can change it through our individual actions. Healthcare is like the government in that it’s easy to identify what’s wrong, but hard to even agree on a solution, much less impose it against the will of far more influential people and corporations who are pretty happy with the present arrangement. That doesn’t mean the book isn’t worth reading as a concise overview of what technologies are on the horizon. It’s good for that, at least for the next six months until it becomes outdated. It also doesn’t mean that Topol isn’t a passionate visionary because clearly he is. However, he could raise an army of fist- and smartphone-waving readers of his book who are upset with how most of us are treated as patients and health-seekers, but that alone won’t get our broken healthcare system fixed. That’s my disappointment with “The Patient Will See You Now.” Reading it makes it easy to see what the future could be while knowing it probably won’t really happen, at least not in this country. I give it 3.5 stars out of five, docking it a half-star for an unrealistic title. Each chapter would have made a great blog post or magazine article, but I’m not finding them as compelling or entertaining in aggregate.